The only joint supplement you’ll ever need! Our trusted high-molecular weight hyaluronic acid (HA) is bio-identical and works to replenish the synovial fluid within the joint. LubriSynHA costs around $1.25 per day. The gallon size is an 8-month supply for horses and large dogs (over 100lbs)! LubriSynHA is absorbed in the mouth and upper GI and is distributed straight to the joints for fast results in 7-10 days. 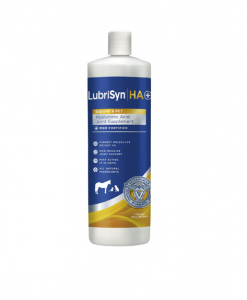 LubriSynHA is a safe and non-invasive option for protecting the joints of your horses and pets. LubriSynHA is an oral application of high-molecular weight hyaluronic acid (HA). HA is the main component of the synovial fluid within all joints. As we age or with injury this fluid begins to breakdown causing pain and inflammation. Taken by mouth daily, LubriSynHA works to replenish the fluid in the joint to reduce the symptoms of arthritis, with users seeing results in 7-10 days. Our high-molecular weight formulation is bio-identical to what the body naturally produces and provides 150mg of HA per ounce of LubriSynHA. 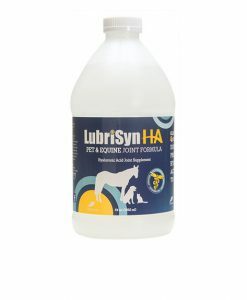 LubriSynHA can be used as a preventative measure in younger animals or to reduce pain in those already suffering from arthritis symptoms. 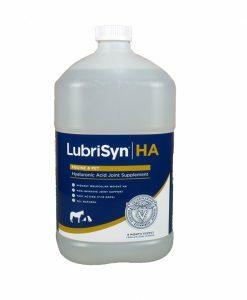 LubriSynHA is available for cats, dogs, and horses and is a safe and effective alternative to injections and harmful medications. You can find dosing and product ingredients for LubriSynHA here. You can find dosing and product ingredients for LubriSynHA Plus MSM here. Which LubriSynHA Formula is right for me? LubriSynHA is available with or without MSM in multiple sizes. 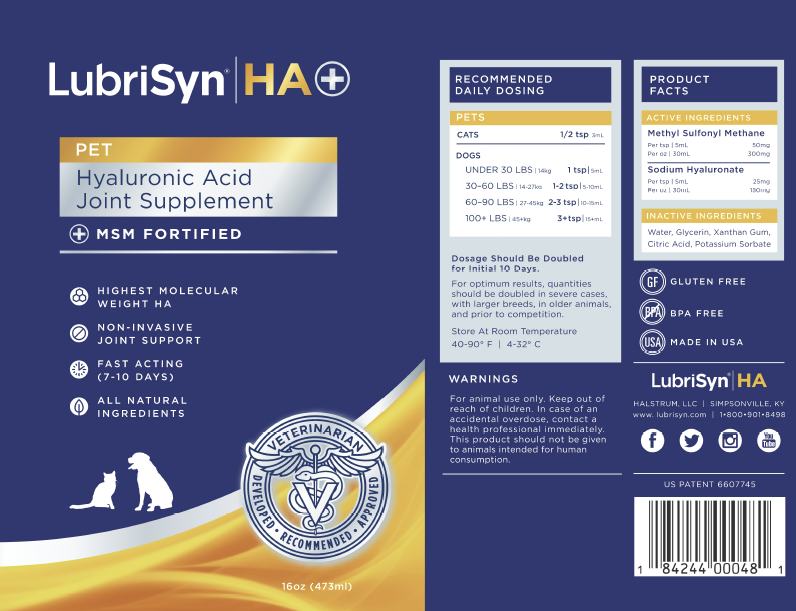 LubriSynHA is available in our original high-molecular weight HA in four different sizes for cats, dogs, and horses. LubriSynHA Plus MSM is our trusted HA formulation plus MSM. 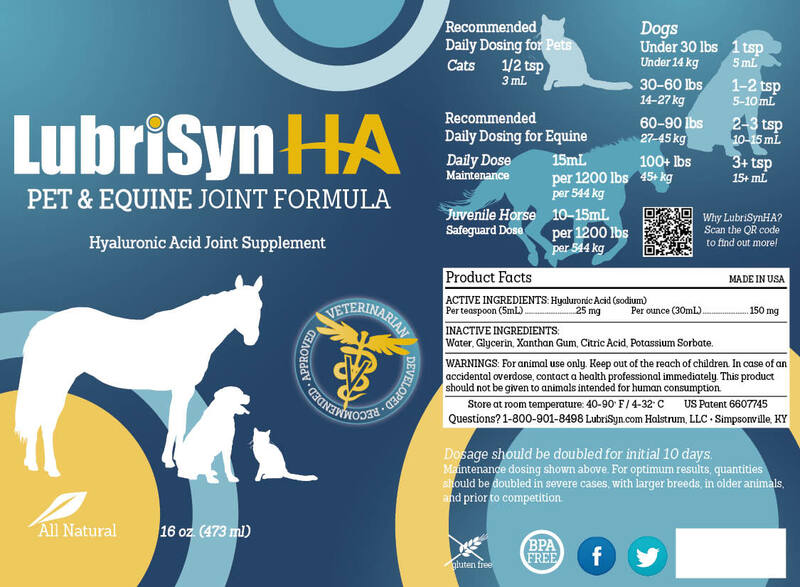 So While MSM addresses the connective tissue, HA builds and protects the synovial fluid within the joint LubriSynHA Plus MSM is the best all-in-one supplement on the market to satisfy all your joint care needs. It keeps him happy and healthy! Our dog had ACL surgery on both back legs but was still having trouble getting around. We thought we might have to put him down. We found LubriSynHA, and ten days later, he was running around like a puppy! 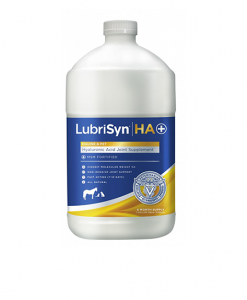 Whether its for my 12-year old cattle dog or my performance horses, I will use LubriSynHA forever. I love that its natural and doesn’t just mask the problem. It allows my animals to not only be more comfortable but also perform to their full potential. All of my animals will remain on LubriSynHA forever! It’s simply the best joint supplement out there and makes such a difference. I have seen great results in my horses, dogs and myself!